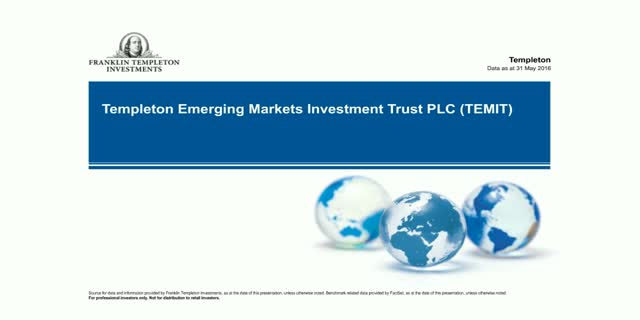 Carlos von Hardenberg, lead manager of the £1.4bn Templeton Emerging Markets Investment Trust, will provide an update on emerging markets and how the portfolio is positioned to take advantage of the opportunities the fund management team have identified. Chetan Sehgal, lead manager of the Templeton Emerging Markets Investment Trust (TEMIT), will give an update on emerging markets. Chetan Sehgal discusses emerging markets opportunities and risks in 2019. Chetan Sehgal, lead manager of the Templeton Emerging Markets Investment Trust (TEMIT), gives an update on emerging markets. In the coming months, risk premiums are likely to rise, favouring stocks which have already been largely discounted for a worst-possible Brexit outcome. Periods such as this often provide meaningful opportunities, and a prerequisite for taking advantage of them is understanding the boundaries of risk and reward. Please join Ben Russon, co-manager of the Franklin UK Managers’ Focus Fund, who will outline the Franklin UK Equity Team’s outlook for 2019. David Zahn, Franklin UK Gilt Fund, believes now is the right time for advisers to re-think the gilt portion of their clients' portfolios. US equity growth has been powered by the twin pillars of corporations and consumers, both of which are growing nicely, explains George Russell, Franklin US Growth Equity Team. Chetan Sehgal, lead manager of the £2.2bn Templeton Emerging Markets Investment Trust (TEMIT), will provide an update on emerging markets and answer investor questions. UK mid-caps are very diverse in their sector and geographic exposure, usually exhibit stronger growth and tend to have a lot less analyst coverage. Please join Paul Spencer, manager of the Franklin UK Mid Cap Fund, who will share the ideas that underpin his portfolio, including details of recent portfolio changes and the opportunities he’s currently finding within the UK mid-cap market. Rescheduled from 5 June, Chetan Sehgal, lead manager of the £2.3bn Templeton Emerging Markets Investment Trust (TEMIT), will provide an update on emerging markets and answer investor questions. Emerging markets have not only embraced technology, they have become innovators and are at the forefront of the latest technological developments, from mobile banking and shopping to robotics, autonomous vehicles, health care and more. How can you weather valuations, inflation and political turbulence, as headwinds like these often impact UK companies. The solution is to ensure that these issues are considered and deliberately contained. You will leave this webinar understanding Colin Morton's theories & strategies, and be able to give your clients peace of mind. Chetan Sehgal, lead manager of the £2.4bn Templeton Emerging Markets Investment Trust (TEMIT), will provide an update on emerging markets, talk through key themes, and discuss some of the opportunities the management team have identified. Chetan Sehgal, Franklin Templeton Emerging Markets Group, on why he believes there is a technology revolution in emerging markets, buying sustainable earnings at a discount to the market and addressing environmental, social and governance (ESG) factors. Please join Ben Russon, co-manager of the Franklin UK Managers’ Focus Fund, who will outline the Franklin UK Equity Team’s outlook for 2018. He will also share his views on the stocks and sectors the team are currently focused on as part of his update on how the Franklin UK Managers’ Focus Fund is positioned to take advantage of opportunities the team have identified. Carlos Hardenberg, lead manager of the £2.4bn Templeton Emerging Markets Investment Trust (TEMIT), will provide an update on emerging markets, talk through key themes, and discuss some of the opportunities the management team have identified. Michael Hasenstab discusses the potential impact of Fed tightening and balance sheet unwinding, widening rate divergences with the eurozone and Japan, political and structural risks across Europe, and opportunities across emerging markets. For professional investor use only. Not for distribution to retail investors. Please join Colin Morton, Manager of the Franklin UK Equity Income Fund, who will explain how a sustainable and growing income can be delivered from a portfolio of mainly large-cap UK equities, while taking less risk than the benchmark. Based on his team’s latest research, Colin will talk about the UK market and the holdings that he believes will offer attractive, endurable yields in the coming months. Subscribe to Franklin Templeton’s channel for new insight and outlook on market trends, fund positioning and product information.